After balloting of DHA Gujranwala 5 Marla plotsplots and submission of down payment now it moves to the next phase. The month of July is up here and payment plan DHA Gujranwala 5 Marla Plots is about to start. First installment is due now and last date for its submission is only a few days away. All 5 Marla plot holders of DHA Gujranwala are reminded about payment of installment on time otherwise they will have to pay surcharge in account of late payment. Moreover, the administration is finalizing matters to start development of DHA Gujranwala on site which will be great for all concerned. All plot holders are hereby reminded that the deadline for the payment of first installment of DHA Gujranwala 5 Marla plots is 20th July 2018. They will have to pay Rs. 242,680 till the mentioned date otherwise late payment surcharge of Rs.121/per day will be applicable after last date. To download Ist Installment Payment Voucher – 5 Marla Voucher of DHA Gujranwala, go to their website and click ‘1st Installment Voucher’tab. 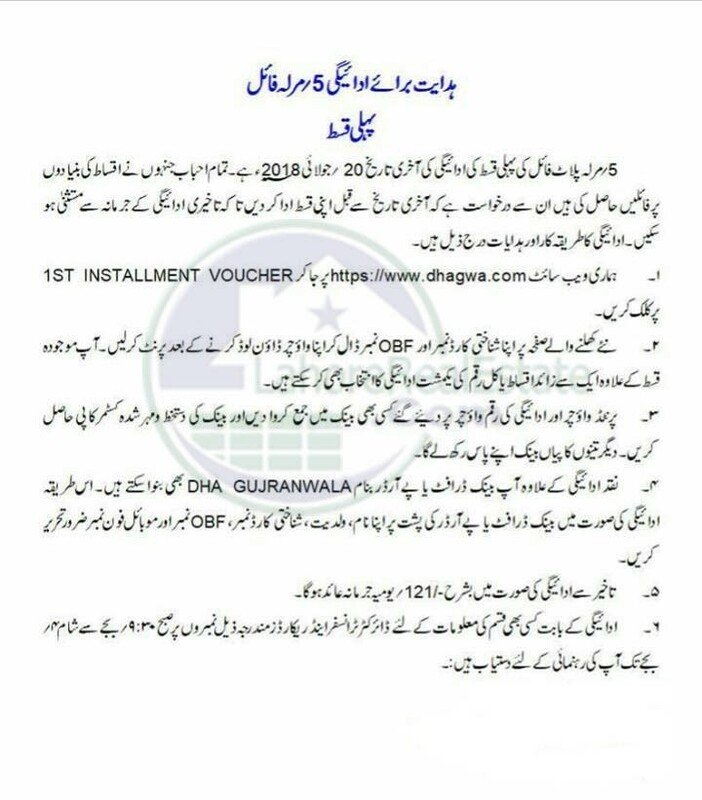 Enter your CNIC/NICOP and OBF number and download payment challan for first installment. Take a print of it and pay installment amount in the respective bank. You can also pay installment in DHA Gujranwala Office as well. For the ease of its customers, DHA Gujranwala allows payment via bank draft and pay order. For payment via bank draft or pay order, don’t forget to write your OBF number, name, father’s name, ID Card number and contact number. Don’t forget to pay your installment on time to avoid surcharge amount. However, if someone wants to pay in full (seven installments), he/she will get Allocation Letter and will have to deposit membership fee according to DHA policy. You can reach me at +14086924710 on Whatsapp or please use +16308024186 & +923224929992.